My Lil Patch of the Planet: Busy, busy, busy! I have been very MIA of late, keeping myself busy with a truckload of work and ventures! I always manage to bite off way more than I can chew! lol Have had a big digi job on .... banners and logos for an online store and lots of other things to keep me busy. Will see if I can bring you up to speed in one large post! We went away for the long weekend (Labour Day hol in QLD) to the Gold Coast for a few nights. We stayed at Breakfree Savannah Resort at Broadbeach which was lovely. Buffet breakfast included every morning means I didn't have to cook for three whole days! We did some shopping and Derek got a new mobile phone (a Nokia 5800) that comes with free music for a year .... so I bet you can only guess what he has been doing. Cody had a lovely time ..... self contained apartments are in no way child proof! so you can only imagine the fun he had! Emptying cupboards, playing in the fridge and "ordering" roomservice on the phone to name a few. On Sunday we went to Currumbin Wildlife Sanctuary (my mum's shout) to see the animals. Cody was by far the noisest kid in the place, screaming with excitement at the top of his lungs for the most of the day. 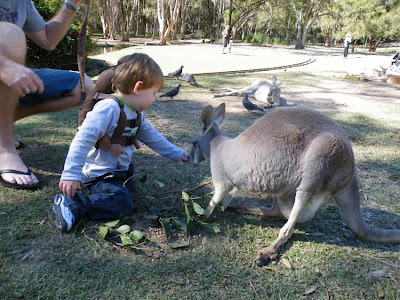 His favourite were the kangaroo's ..... he even tried to pinch a joey out of one of the mother's pouches ...... I am so surprised she didn't wallop him ..... they must be so used to human contact. I was lucky enough to be able to take a workshop with an enormously talented and awe inspiring scrapper named Jude Harvey. (thanks Dad for minding my rugrat) Her workshop was teaching the principles of Shabby Chic and this is the layout that I created through taking the class. The photo is a picture of my Grandma (who I never actually met, or remember meeting) on my dad's side. 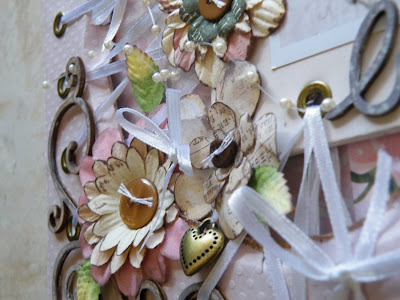 It was part of the scrapbook that I gave my mum for Mother's Day ..... I am going to scrap all the old family photos and give them to her to keep in it. On other news I have been making shop samples for my local scrap shop Paper Addiction. I have done quite a few so far and you can see some of them on their blog. 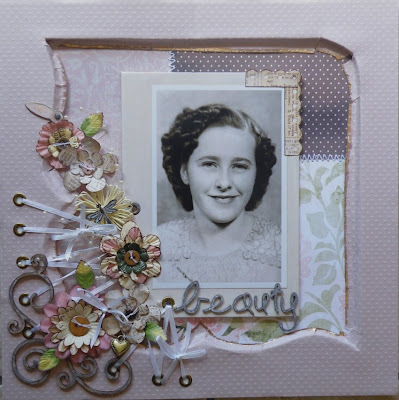 I will be teaching my first class there in June so have also been busy making up sample layouts for this. I have one more to finish off by the end of this week and then they will be displayed instore till the class takes place. Mothers Day was lovely! I was spoilt with two new beads for my bracelet. I don't have pics to share but one was a silver butterfly with a pink stone centre and the other a silver flower with a blue stone centre. We had afternoon tea in the park with the family and the kids got to have a play as well .... it was a lovely day in all. I was so exhausted I fell asleep at 7.30 and didn't even bother with dinner. Anyway I think that's enough for now and will help catch you up during my absence. Gotta run as I have an $80 order for some of my handmade flowers to get ready for posting! congrats on the teaching job at paper addiction!